Get some healthy breakfast ideas with photos of five sample breakfasts. In another post, Is breakfast really the most important meal of the day?, I discussed why eating a balanced breakfast is so important for blood sugar regulation, maintaining even energy levels throughout the day, improving overall energy levels, and supporting the adrenals (which need support for many people today). I also discussed how breakfast should include protein, carbs and fats to keep blood sugar levels within the normal range. Eating toast with nut butter or butter, a breakfast bar, cereal with milk or just oatmeal is anything but balanced, and is particularly troublesome for those already with blood sugar issues. This is because the a meal of just carbs with little fat or protein spikes blood sugar levels, thereby causing a crash in blood sugar and energy levels. A meal of not enough calories, even if balanced, also will not be enough to bring up blood sugar levels to the optimal range, causing blood sugar issues and taxing the adrenals. Click on any photo to see a description. On Day 5, I had very little time to make breakfast so I had oatmeal from soaking oats overnight in water and lemon juice to minimize the mineral-binding phytic acid and enzyme inhibitors found in all grains. In the morning, it cooked up in 5-10 minutes. 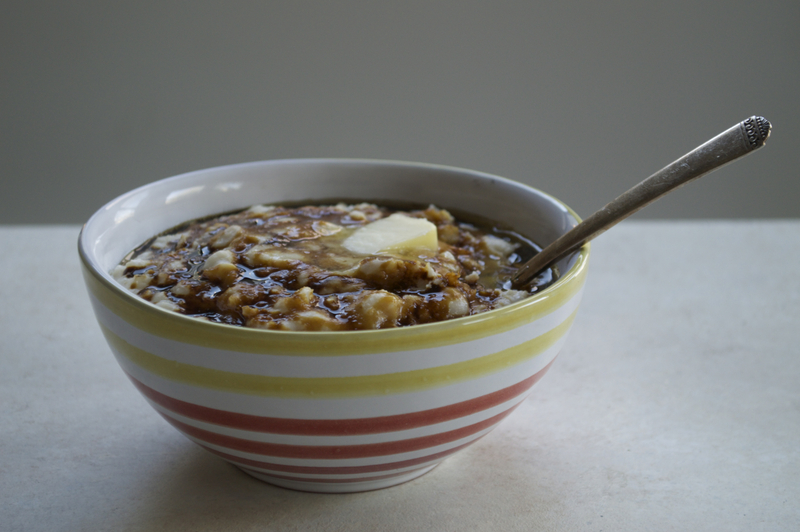 I added organic pastured butter to slow the absorption of glucose into the bloodstream from the carb-rich oatmeal, thereby preventing a spike in blood sugar leading to a crash. The Vitamins A, D and K2 in the pastured butter helps us to neutralize the rest of the phytic acid; the fat itself helps us to absorb the vitamins and minerals in the food the butter is paired with; and the fat increases satiation and provides long-burning energy. I added unsulphured blackstrap molasses for a nutrient-dense sweetener and collagen powder to the oatmeal to add in some protein. Not an ideal breakfast, but it will do in a pinch. So how do you build a nutrient dense breakfast? Plan ahead. My carbs for breakfast tend to be white potatoes or sweet potatoes most mornings, or banana in a smoothie. I make sure I have some baked a day or two ahead of time. Then in the morning I sliced them up and fry them in leftover bacon fat or ghee in one pan while I prepare the rest of the meal in another pan. Other options for carbs are sliced plantains fried in ghee or coconut oil, plantain pancakes, and some properly prepared grains, like oatmeal, white rice porridge, or buckwheat pancakes. For my protein, I like to use leftover meat from last night’s dinner, or if I want to eat that leftover meat for lunch, I will brown some breakfast sausage links or ground sausage patties, fry eggs, or make bacon in the oven at 350° for 20 minutes. If I get tired of sausage, bacon and eggs, I can add some lox to the sauteed vegetables at the very end just to warm up. 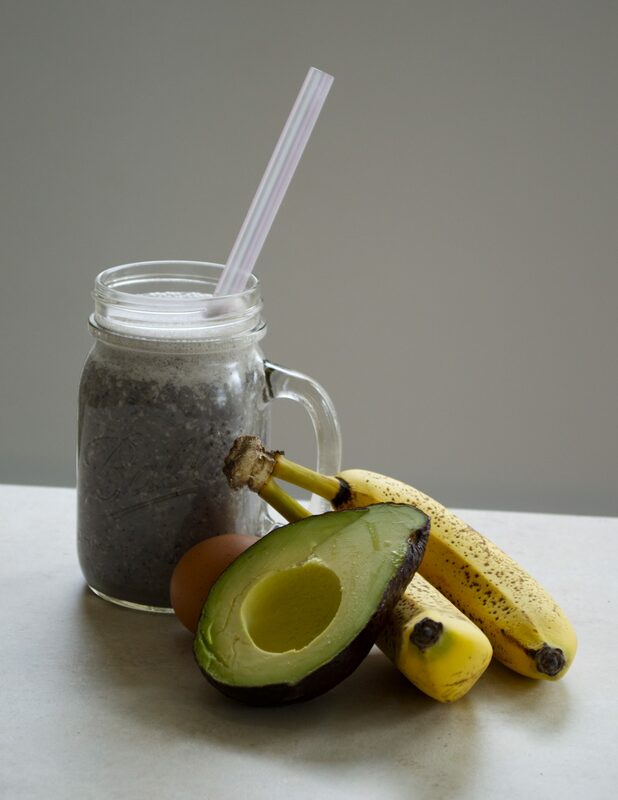 If I’m in a hurry and only have time to make a big smoothie, it better be one hefty smoothie to get in enough calories and grams of carbohydrates, protein and fats. A couple bananas should provide enough carbohydrates, but it requires a quality protein powder to get enough protein. Though collagen powder like Vital Proteins is nice, it doesn’t give enough protein. (You should be aiming for about 30 grams of protein for breakfast if you have a good appetite). I like to add in at least a cup of veggies at breakfast to up my daily intake of vegetables. I also add in a cup of fresh spinach to my smoothie. Did you know that the more fruits and vegetables you eat, the lower your risk of dying from any cause? This study showed that those who ate five to seven servings (about 5 to 7 cups) of vegetables and fruits per day had a 36% lower risk of dying from any cause. I sometimes use leftover cooked veggies from last night’s dinner, or add in any quick cooking veggies, like mushroom, tomatoes, and my new favorite, fresh spinach lightly steamed at the end. I’ve been eating a citrus fruit before my regular breakfast to bring up my blood sugar right away in the morning. The vitamin C in the citrus also supports the adrenals. Vitamin C makes up the adrenals; is released under any type of stress (not just the environmental stress you feel) so we need to replenish it; is used to make adrenal hormones epinephrine and norepinephrine; and also supports the immune system. And lastly, add some sauerkraut, store-bought or homemade, to add food-based probiotics for a healthy gut. Does the thought of making and eating such a hefty breakfast seem daunting? Yes, you will have to make more time in the morning to prepare the food, and eat it if you need to eat within 30-40 minutes of rising. Yes, you may have to train your body to sleep earlier so you can get up earlier. No, you may not be hungry in the morning, but your blood sugar and your adrenals will be really happy if you can nourish yourself with a balanced breakfast. Plan ahead, and try eating this way for one week and see if you feel any better, and let me know your experience in the comments below!